To say that Nvidia is interested about artificial intelligence is an understatement. It's like saying Nvidia finds technology interesting. The company's AI platform, it said, is a decade-long, multibillion-dollar investment that it made to advance the science of AI computing. One can say Nvidia has got with the trendiest program—as tech giants compete with the best and brightest of teams to push AI further ahead. "Artificial intelligence and machine learning is the buzzword not only in tech but even in the enterprise," wrote JC Torres in SlashGear. "Even for some developers, however, AI remains an almost esoteric field accessible only to those with beefy computers that can handle the workload." "Sophisticated AI generally isn't an option for homebrew devices when the mini computers can rarely handle much more than the basics," said Jon Fingas in Engadget. "The power of AI is largely out of reach for the maker community and in education," said Nvidia, " because typical technologies do not pack enough computing power and lack an AI software platform." Nvidia believes that's something it wanted to think about—and much more. Stay very tuned as Nvidia kicks the doors down for makers with a system for AI tasks. The "IT" is a pocket-sized module, an AI computer, Jetson Nano. As the title suggests, it is as tiny as it is strong, at 70 x 45mm. 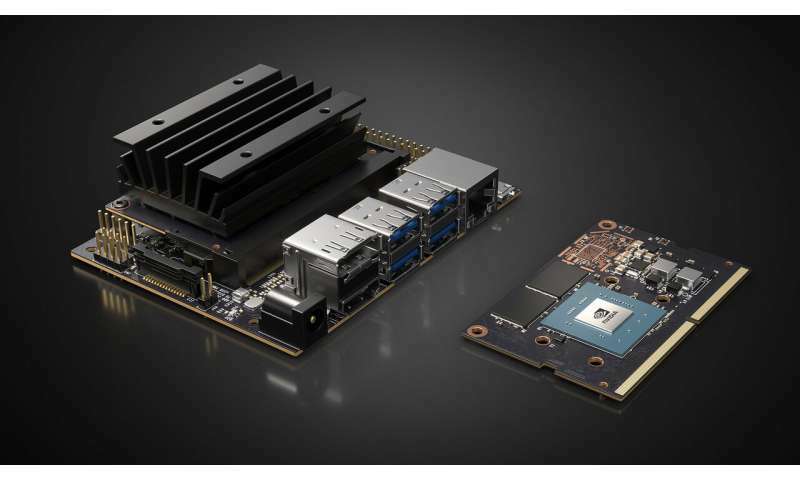 Long and short, the GPU superstar is bringing out the Jetson Nano. Nvidia tells the world that it is bringing the power of modern AI to devices, in the form of a small platform. "It opens new worlds of embedded IoT applications, including entry-level Network Video Recorders (NVRs), home robots, and intelligent gateways with full analytics capabilities," said the company. AI can be deployed to devices across industries, from smart cities to robotics. This will mean something for humble tinkerers too. Engadget: "You could build your own robot without spending a fortune." Chris Anderson of the Linux Foundation's Dronecode project had compliments for the kit as bringing "advanced AI to the DIY movement." Anderson also said it was a "great way to teach deep learning and robotics to a broader audience." Jetson is Nvidia's platform for AI and the company positions it as ideal for computer-intense projects. It can deliver high performance and low-power computing. "On the surface, at least, it could hit the sweet spot if you're looking to build your own robot or smart speaker," said Fingas in Engadget. It comes with 4GB of RAM, gigabit Ethernet and I/O that you would need for cameras and other attachments, he wrote. Performance? It delivers 472 GFLOPS of compute performance for running modern AI workloads. Low-power computing? It is capable of consuming as little as 5 watts. Chris Duckett in ZDNet said, "For H.264 and H.265 video, the Nano is capable of processing eight 1080p streams in parallel while running object detection on all eight streams simultaneously at a rate of 30 frames per second." The Jetson Nano module is $129 in quantities of 1,000 or more and will begin shipping in June, sold through Nvidia's distributors. A kit video's notes said the Jetson Nano kit was a computer "that lets you run multiple neural networks in parallel for applications like image classification, object detection, segmentation, and speech processing."